Pumpkin soup is one of those recipes which either can be a super delicious dish or taste as dull as dishwater. That depends on how much “love” goes into its making. There are as many pumpkin soup recipes as there are chefs in the world because, as the saying in culinary slang goes, “there’s more than one way to skin a cat” that is, each chef has his/her way of doing things. 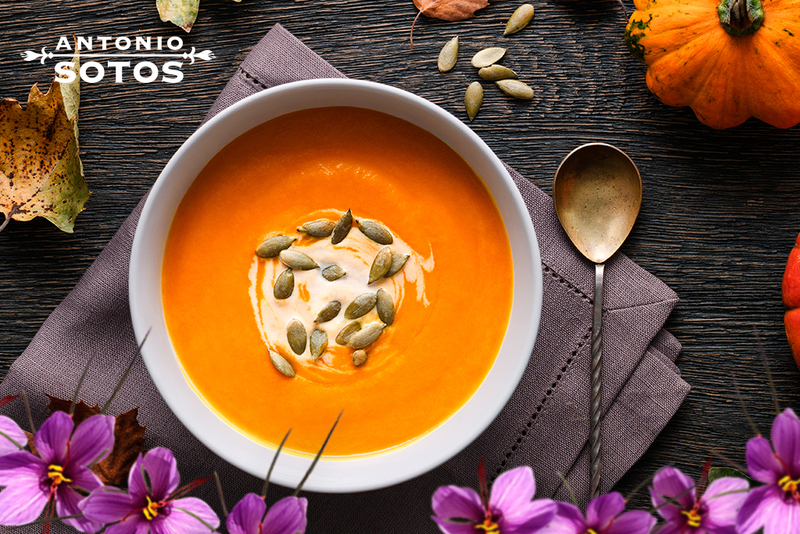 We suggest a saffron pumpkin soup as simple as is delicious. For preparing this saffron pumpkin soup recipe, it is recommended to use saffron strands. You’ll only need 3-4 strands. Crush the strands in a mortar and add 10 minutes before finishing cooking. This is how the saffron strands should be used in stews so that it floods the dish with its unmistakable aroma and flavour. Peel and clean the pumpkin, scooping out the seeds and removing the ‘whiskers’ from its interior. Dice into identical sizes so that they cook evenly. Peel and roughly chop the onion. In a heavy-based saucepan, add the extra virgin olive oil and when hot, add the onion. Stir a couple of times and add the pumpkin pieces. Reduce the heat to low and leave to sauté slowly. The pumpkin will lose water whilst cooking. As the pumpkin dries, add a splash of vegetable stock and so on until the pumpkin is tender. Do not add too much stock at once as the soup may not reach the desired consistency. The pumpkin will crumble as it is stirred. When the pumpkin has about 10 minutes of cooking left, add the saffron strands, as we have specified. When cooked, remove from the heat and blitz in a blender. Add stock to taste until the soup has reached the desired consistency and texture. Salt to taste. The dish can be served by adding a dollop of sour cream and a couple of saffron strands.